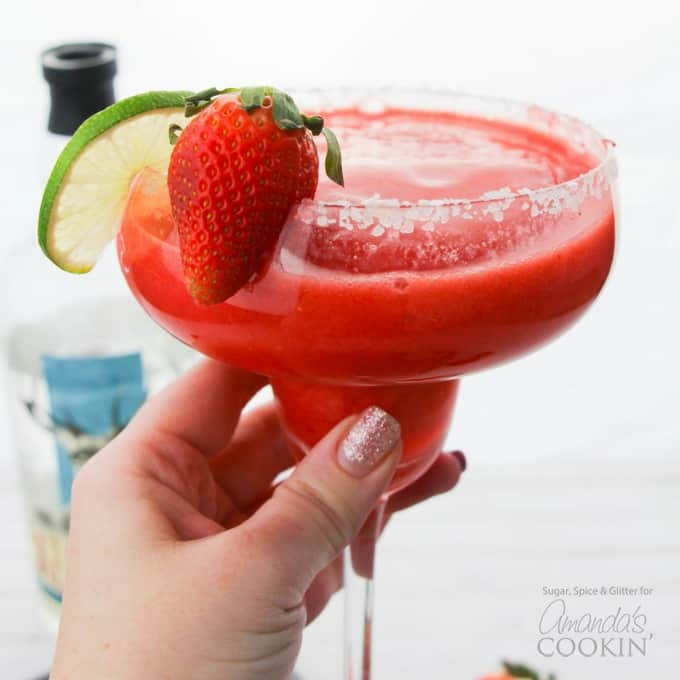 This Strawberry Margarita is the best way to enjoy tequila! A perfectly balanced cocktail for those who love the taste of tequila without the bite. The ever-growing divide between margarita lovers remains: frozen or on the rocks? I think both are perfectly delicious and acceptable, but this frozen version is definitely more fun for celebrating and is perfect for cooling off your tongue after some spicy dishes, like our Chicken Enchilada Dip or our Spicy Fish Tacos. 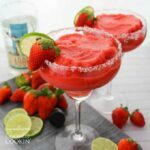 I also find that the taste of tequila is a little smoother in these frozen margaritas – especially with that salted rim, you have all these delicious flavors intermingling and working together – sweet strawberries, tart lime juice, and salt – so your tongue doesn’t focus too much on the sharpness of the tequila. RELATED: Looking for another classy but tasty drink recipe? Check out our Lavender Rose Spritzer! Or our Mango Margarita Slush for another refreshing, blended margarita! 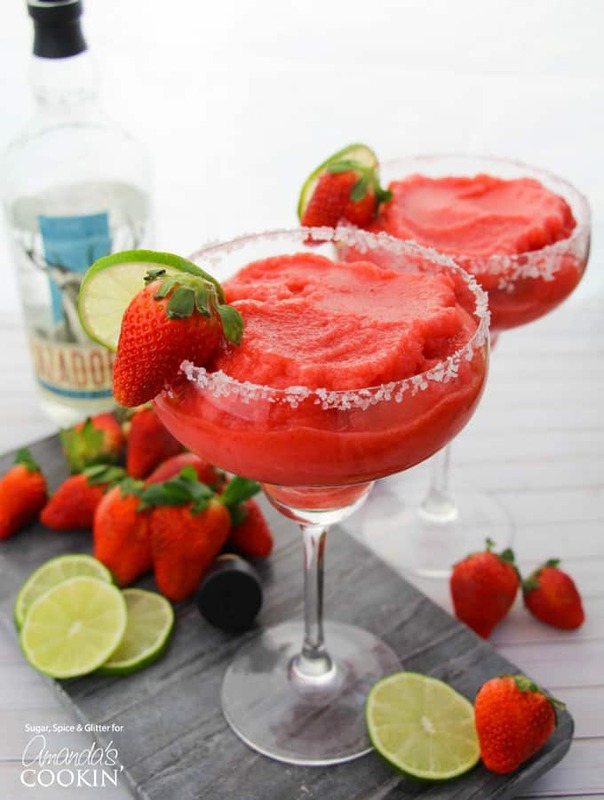 But, really the flavor of this strawberry margarita recipe comes down to two things – the quality of the strawberries that you use, and the quality/type of tequila. Personally, I can only handle silver tequila which features the blue agave in it’s purest form. On either side of that, you have two versions of “yellow” tequila – gold tequila or reposado. Gold tequila is probably what you would refer to as the “cheap stuff” – while reposado is aged tequila and apparently gets smoother as you increase in vintage. My rule of thumb is to pick a tequila that you can drink straight – that is going to give you the best taste. Don’t pick something that needs to be mixed in order to taste tolerable, because that’s not going to enhance this drink! 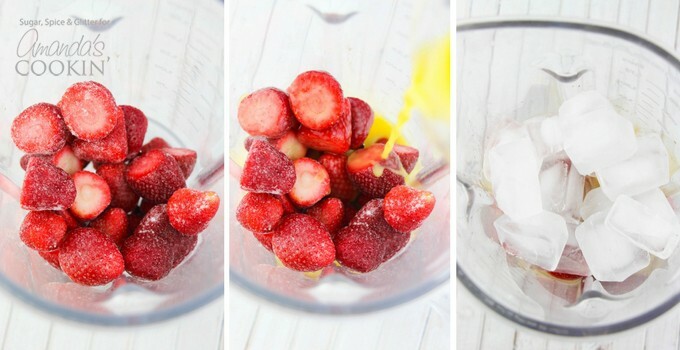 Tip: if using fresh strawberries, you may want to use 3-4 cups of ice. I’m curious – do you prefer your margaritas frozen or on the rocks? And what’s your favorite type of tequila? 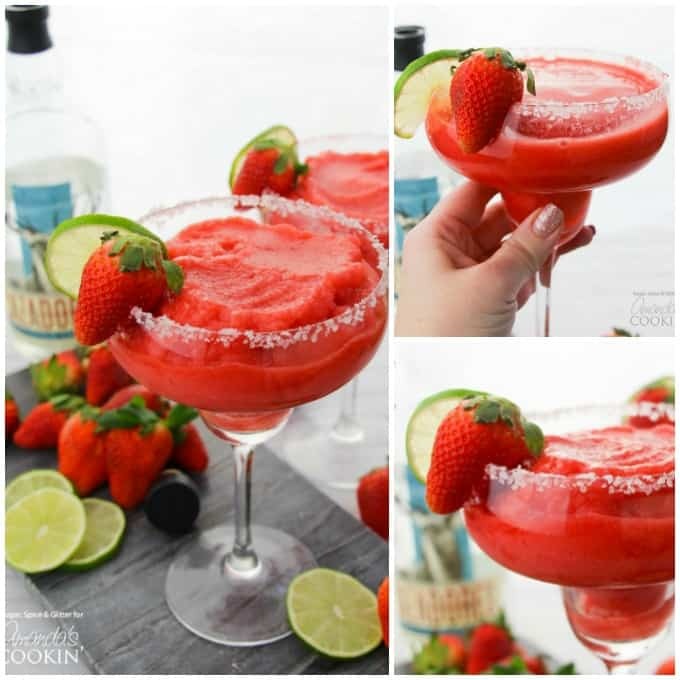 This strawberry margarita is the perfect drink to cool you off in the summer. Great for sippin’ at a BBQ or gathering with friends and family! Another two of our favorite summer drinks that are perfect for crowds is this Pineapple Rum Slush or these beautiful Mermaid Cocktails! Maybe jello shots are your thing? If so, these Watermelon Jello Shots are great for crowds as well, and are always fun to bring along to a potluck, BBQ, or holiday gathering! We’ll show you two different ways you can make these jello shots, both of which are shaped as watermelon. Fun, right? Watch just how easy these margaritas are below! 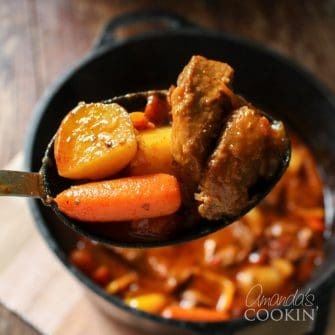 Place all ingredients, except optional garnishes, in a high-powered blender and puree until smooth. Run a cut lime along the edge of the glasses and dip into the margarita salt. Portion the margarita mix into the glasses, then garnish as desired with lime and strawberry. 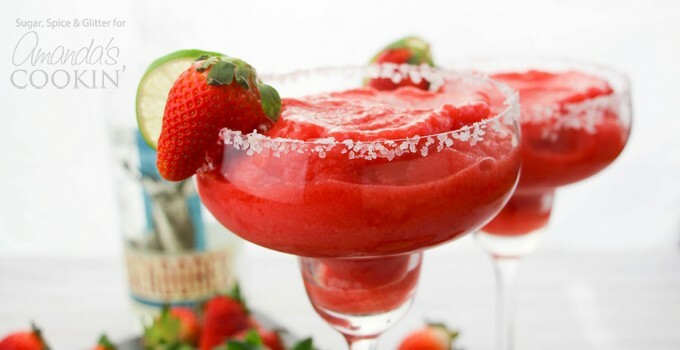 This looks delicious, but I have never had salt with a strawberry margarita only a sugar rim. Is the salt better? It’s a personal preference! I say try it, if you don’t like it you can always go back to sugar. Experimentation sounds fun haha! So pretty! I love margaritas, and this one has such a beautiful color. Will definitely try it soon – it’s a great idea for hosting.